This past weekend when I was home for Thanksgiving, I gifted one of my favourite quilts to someone I am especially thankful for. This Salt Water Swoon Quilt was made specifically with my grandma in mind and I was so excited to finally share it with her. For as long as I can remember, my grandma has had an extensive sea shell collection. Meticulously selected, each shell represents a place, an experience, a trip she has taken with my grandpa. When I spotted Tula Pink's Salt Water line, I knew it was exactly the line I had been waiting for. ...my grandma loves to garden and more than anything, she loves flowers. She once told me me that had she been born in another time, she would have simply loved to arrange floral bouquets. Knowing that, Thimble Blossoms' Swoon Pattern seemed like an obvious choice when deciding what to whip up with the Salt Water bundles I ordered. This is the first top that I have made that I didn't quilt myself. Instead I opted to send this to a local long arm quilter, who also happens to know my grandma. She did a fabulous job I think it reflects my grandma's aesthetic perfectly. Swirls, flowers and hearts all over. For the backing I chose to feature the seashell print in the blue colourway, as that just so happens to be one of my grandma's favourite colours. I decided to bind it in a darker blue print from the same line to help ground the linen background of the quilt top. My goal for this quilt was to make it fit her taste and aesthetic, but also I wanted to ensure it was something really wonderful to snuggle under. Although the linen background made for quite a challenge at times, I am thrilled with how soft to the touch it is, and I may just be tempted to work with linen again. This is my first completed project for the Q4 2013 Finish A-Long - read more about my other goals here. Linking up to TGIFF and Finish it up Friday over at Crazy Mom Quilts. The quilt and quilting is beautiful. I love the fabric choices. Oh wow - it's stunning. What an amazing gift for your grand-mother! That line is amazing and your quilt is absolutely beautiful! What a beautiful quilt! It seems to suit your grandma perfectly! What a thoughtful and beautiful gift, Kelsey! I'm sure your grandmother will 'swoon' over it (sorry, couldn't resist!) -- it's gorgeous! Thanks for linking up to TGIFF! and OctoberQuest 2 -- good luck! SO beautiful, and your thoughtful details will make it even more special to your grandma! Oh, I love this! It's absolutely stunning and the story is priceless! This is just beautiful, and will surely be loved and cherished. Kelsey, it's really gorgeous. Your grandma will love it. The quilter did a really nice job too. Absolutely beautiful Kelsey! The quilting is fantastic and i love your choice for the back and binding. Gorgeous! This is beautiful! What a wonderful gift for your grandmother. This swoon is beautiful! The quilter also did an amazing job. I love this! Your grandma sounds like a great lady! I am sure she will cherish your beautiful gift. And the blue binding was a fabulous choice! What a lovely quilt and lovely story! 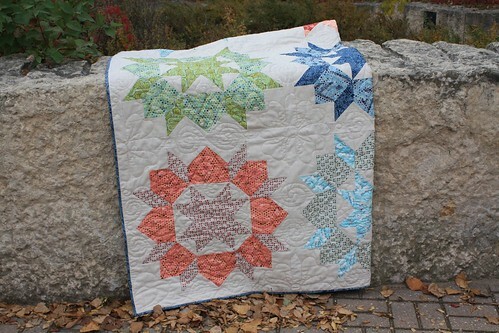 I love Tula's fabric and it looks great in the Swoon! Congratulations! A beautiful quilt, and a beautiful story. I'm still auditioning fabric for my Swoon quilt. Nice to have a finish checked off, isn't it? oh. my. goodness! 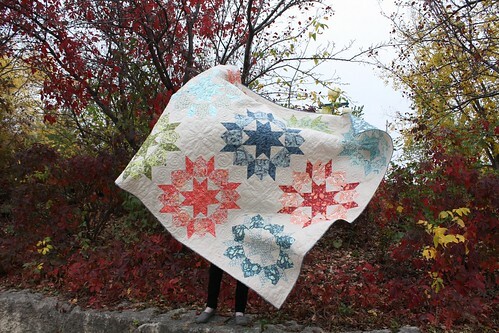 This quilt is so gorgeous! 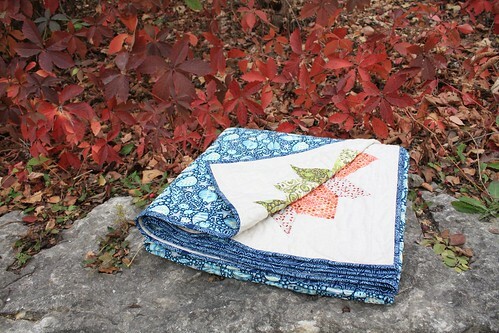 I love that fabric line and your quilt really shows it off! Super gorgeous, Kelsey!! I love it! I bet your grandmother loves it too! 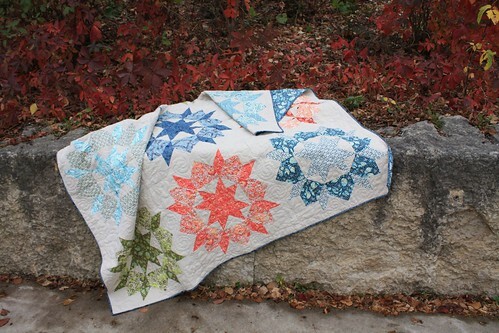 Gosh, I need to make a swoon quilt! Gorgeous! What a touching gift, I love hearing the stories behind the quilts! This is a wonderful quilt, and a lovely story too. Stunning! 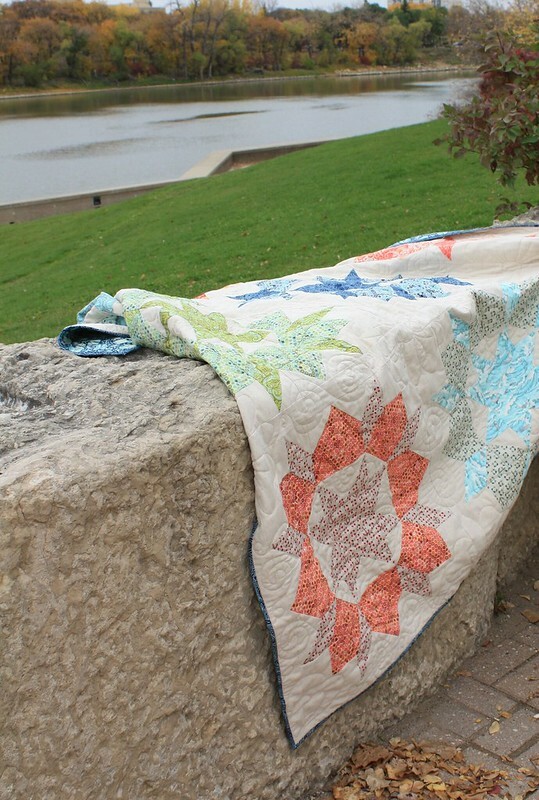 Great story for a fabulous quilt and grandmother! Nicely done. What a lovely and thoughtful quilt! Salt Water is such a fun line, and I think it is great how you tied the project to things your Grandmother loves. This is absolutely beautiful! 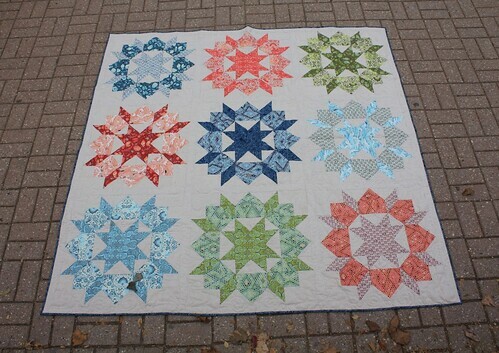 I loved the first few blocks you posted and the finished quilt is fabulous - you have a very lucky Grandma! Beautiful quilt - what a loving gift!